Jerry Seinfeld: If every instinct you have is wrong, then the opposite would have to be right. In the NBA, there are few instincts worse than those possessed by Chicago Bulls ownership, the opposite would almost certainly be the Golden State Warriors. Every NBA season has a particularly wonderful set of moments that define it as an equal number of moments that mar it in an approximate manner that leaves a great evening out. For the 2018–19 NBA season, that great evening out arrived on January 15, 2019. A few years ago, during the 2015–16 season, there was one particular series of events that really captured the essence of that season. In a game that was already decided, a win for the Sacramento Kings turned into the best kind of dramedy as both Rajon Rondo and then DeMarcus Cousins found themselves ejected in the closing moments of a win. These moments encapsulate a season in a neat way. A team defined by their struggles and failures finds a way to turn a mundane late season victory into the highest form of entertainment. Rondo and Cousins the perfect actors to turn the script on its ear and leave you incredulous, but also wanting more. Each season presents its unique story. For me, to achieve this moment requires The Opposite. When everything is going extremely well, as it was for both the Golden State Warriors and Denver Nuggets — though much more so for the Warriors — in the first quarter of their shootout on January 15, there was an absolute bomb of a game happening between the Chicago Bulls and Los Angeles Lakers that featured one of the worst first quarters of basketball that you could draw up. First, let’s dive in to the breathtaking gunfight that was a first quarter feast of basketball beauty between the top two teams in the Western Conference — the Nuggets and Warriors. The game was played in Denver, but that didn’t seem to bother the visitors much. The furious pace of the opening stanza left me completely beside myself. By the end of the first quarter I simply expected every shot to go in, including Jamal Murray’s buzzer-beating heave from just left of the mid-court Nuggets logo which he banked directly into the basket less than seven seconds after he had connected on another 3-pointer and just four seconds after Kevin Durant had made an uncontested slam dunk. Forget the other 11:53 of first quarter game play, that was just the last 6.8 seconds. Meanwhile, despite the tour de force of 10-loss Golden State and their host Denver, the 10-win Bulls and Lakers arrived to their gunfight, both brandishing butter knives. LeBron James didn’t play and Kris Dunn finished with a game-worst plus-minus of -25. But it’s always about the opposite. Both games evened out, at least somewhat, after tumultuous opening periods. The Warriors set a franchise and NBA record for most points in a first quarter (51) while the Nuggets played better sustained basketball than almost every other team in the league for 12 consecutive minutes (38 points, 60% shooting). On the other side, Michael Beasley went coast-to-coast, including a behind-the-back dribble through traffic, right down the lane, then kicked out to Kentavious Caldwell-Pope who bricked a wide-open 3-pointer. Neither team converted from long-range in the first quarter — shooting a combined 0-for-13. The Bulls starting five for this game was Chandler Hutchison-Zach LaVine-Lauri Markkanen-Wendell Carter, Jr.-Dunn. Incredibly, all five of those players were still on the roster for the final game of the season in April and none of them played. Mostly, it was for health reasons, but Hutchison was listed as Did Not Dress. Jabari Parker led Chicago in scoring off the bench, Bobby Portis was 1-for-11 — both were traded to the Washington Wizards a month after this game. In Denver, it was The Opposite. eFG%: Golden State 96%!!!! — Denver72%!!! For the game: Draymond Green had 4 PTS, but was +41. Andre Iguodala played 21:29, and had an ORtg of 183! For Denver, Hernangomez played more than 16 minutes and sported an ORtg of 168. These are small sample sizes, but not that small. This is easily the worst half of basketball I've seen all year. This is tough to watch. The Lakers have played poorly but the Bulls are so terrible that they're getting blown out. Guys running into each other on offense, no idea where they're supposed to go, chucking up shots to avoid violations. It's game 44. This should not be happening. It’s the moments like these that almost feel like you’re suspended in a dream state. It’s when The Opposite shows itself. It’s the beauty of moments that shouldn’t align and yet, in basketball we’re giving a beauty to match the ugly. It’s a special kind of umami for your hoops-loving brain. And, as if this special alignment of amazing and awful during first quarters on a Tuesday night in January wasn’t enough proof that it always evens out, the NBA universe had one more treat in store for us. Those same two players that gave me this special moment a few season earlier, aligned once again. Rondo sat on the bench for the Lakers, his team of the moment, while Cousins was a member of the Warriors. It’s amazing that three seasons later, The Opposite pulls through. See, things always even out for me. A very long time ago, my roommate had a gaming console, Nintendo 64 I think. At some point, we stumbled upon the video game titled Gauntlet Legends. It was considerably more fun than it should have been and we played it for dozens of hours more than we should have ever considered healthy. Perhaps, I have a love of gauntlets or the word gauntlet or maybe I just like to go on wild adventures that involve consuming excessive amounts of food - primarily focusing on sugar and fat. Enter the 2018 Minnesota State Fair Food Gauntlet. 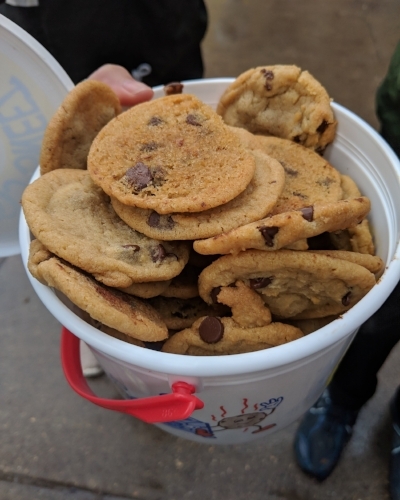 To set the stage for my experience, I feel it is helpful and perhaps comedic to consider that prior to my experience on Labor Day weekend in the year 2018 A.D., I had never gone further into the fairgrounds than Sweet Martha's Cookies. 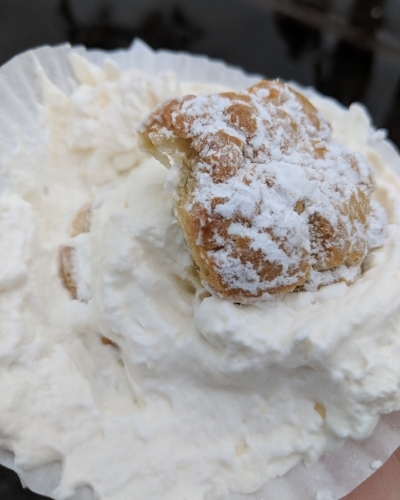 In fact, I had only twice in my entire life visited the State Fair and on both occasions I went directly to Sweet Martha's and then immediately left. For this, my first proper excursion, I enlisted my wife, two good friends, and what I would call a Food Sherpa. The food Sherpa leads this excursion annually, but this was my first time joining the party that would seek to ascend Mt. Fair Food. Wake Up: 6:15 a.m. It's going to be a day, but to limit the suffering of (being surrounded by) the masses, one must be the earliest bird to the pile of delicious deep fried worms. Get some coffee, avoid food. Any caloric intake at this point will only sabotage the rest of the day and your experience. On the Road: 7:25 a.m. Sure, it would be ideal to get rolling much earlier if you're going to wake up so early, but getting coffee, stopping by an ATM, gassing your car, making sure your phones are charged, etc. - these are important components of State Fair survival. You simply cannot rush them. 8:35 a.m.: Rain. But of course, we knew this was coming. Rain jackets were packed and this strikes no fear in our hearts. When you're preparing to attack the State Fair, you must factor in all elements, particularly rain and/or snow, surely to be followed by intense heat. After all, we are talking about late summer/early fall in the upper Midwest. 9 a.m.: The weather and holiday weekend have combined to completely eliminate traffic, gets us a parking spot just one block from the fairgrounds and has us sprinting through a downpour to the front gate. We're soaked, but we're in, the streets are completely empty, and there are no lines at any of the vendors. Everyone takes turns buying. This saves everyone a lot of money and allows you to sample more things. Everyone shares the one thing. If someone loves it, they might have more than the others. If someone doesn't like it, they might only try a bite or two. It all evens out and this way you don't get too full or overwhelm yourself too early. If you see something you want, get it. Don't leave the fair thinking about how bad you wanted to try a turkey leg after walking by the stand three times but never stopping. Divide and conquer. Always travel in your group, but when you approach vendors with long lines establish a meeting point and then split your group so you can cut your waiting in line time in half. It's also nice because you can split the group however you want and spend time getting to know your Food Sherpa or catching up with old friends and new acquaintances. Our Food Sherpa had arrived earlier and was waiting for us upon arrival. He had already acquired the first food item of the day: Carolina Reaper dumplings with a Carolina Reaper-infused marinara. It was good and pepper was present almost exclusively in name and the spicy factor was less than that of a mid-level Habanero. Still, watching the two members of our party who cannot handle spicy food try it was amazing as they both found it to be very intense. Our first group stop was the Australian potatoes. The group selected them with ranch dressing. I didn't get a picture, but it was alright. If we skip this vendor in the future, I won't miss them. The portions were insane. We got a small and it was more than enough for the five of us. One of our group dove in and ended up with ranch-covered hands. I do not recommend covering your hands in ranch dressing. Before getting more food, we did the rounds through the cows, pigs, goats, and horses. This gave us a bit more time while the weather had a fit. The size of some of the animals was intense. There was a 1,040-pound pig. That's too much pig, man. The rain had taken a pause, but there was still absolutely no line for anything. Using one of Food Sherpa's rules, we split the group in two. My group hit the strawberry shortcake. It's a staple treat that does something unlike any other food. It is neither remarkable, nor would I skip it. It's just really solid. Maybe that's the Midwesterner in me. The rain was starting to kick in again when the other half of our group returned with their food item. This was sneakily my favorite ice cream-based item of the day. It was simple, but pecan and maple syrup - two ingredients that make the best version of pecan pie - combined with whipped topping and ice cream ended up being a really solid, obvious choice. Would eat this again every time. It looks small, but it's packed with a punch of sweet flavor. Imagine a slightly dry biscuit with just enough texture to even out the sweet and airy vanilla-flavored whip. As a novice, I asked about eating utensils and was informed that the correct way to eat the puff was to break off the biscuit and scoop. Brilliant. The pirogies were decent filler, but they were unremarkable without the accompanying horseradish-based dipping sauce which turned it around. Without the sauce, I would have definitely put these at the bottom of the board. Good save. 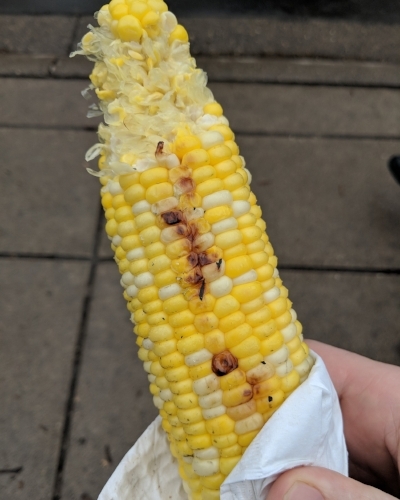 The blue cheese and corn fritz was good, took me by surprise. It was served with a chimichurri sauce. They came in an order of five, so there was one for each of us. This was an item I would have been happy to eat one or two more of, as it had a good flavor and texture and the balance provided by the savory after a lot of sweet really hit the spot. I guess this is an item that was talked about a lot at the fair. Sounded like it was going to be a very bad item to eat. It wasn't. 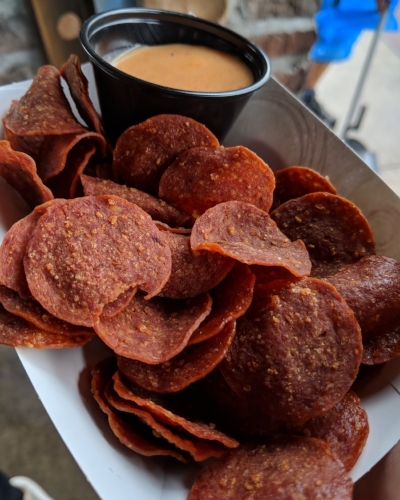 I was actually concerned about how good it tasted, particularly when paired with its dipping sauce, which seemed to be a queso-based dip of some sort. I'd have these again. 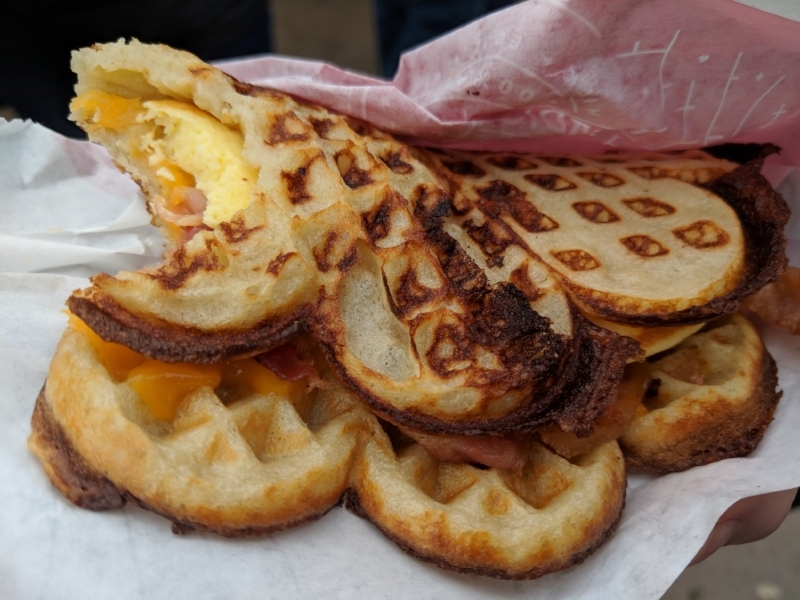 A waffle sandwich with berries and cream couple with a waffle sandwich with bacon, egg and cheese. Soft waffle texture. These were fine. 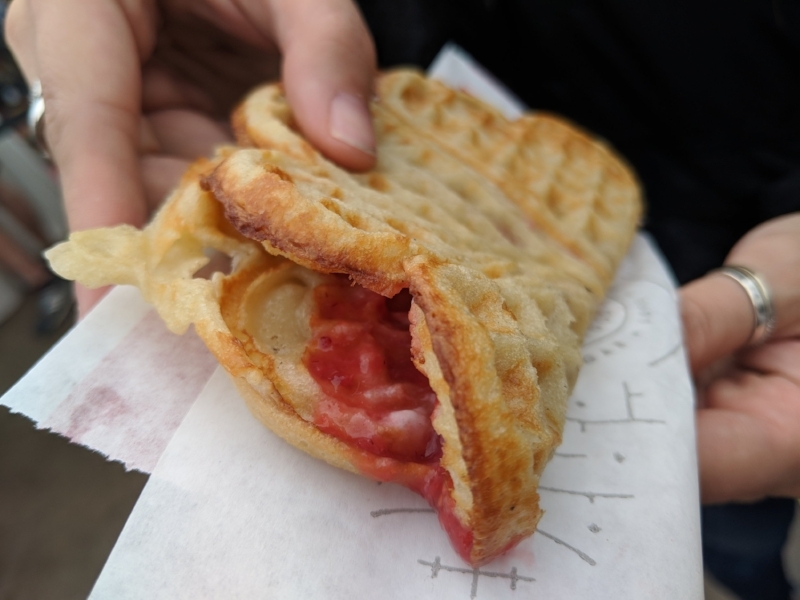 I've only had one other waffle sandwich experience, in Huntington Beach, and it was superior to this. The egg was good when combined with everything else that had already been eaten during the trip, but considering the extremely long line, these didn't live up to the hype. Yes, the very famous cookies. I was proud of myself for ONLY eating a handful and not diving in and overdoing it. I feel like this is the one universal item that everyone already knows about. No further explanation needed, it's a must every time I visit the fair. Honestly, this item is extremely out of place at a state fair of any kind. It isn't deep friend, has no breading, has the healthy kind of fat instead of the kind that chokes out your heart, and instead of being drenched in sugar, it tastes superb with a squeeze of the lime slice they provide. Could have easily eaten the entire thing by myself. Extremely refreshing, almost like a palate cleansing option midway through the trip. The story goes that this corn is grown specifically for this vendor with precise timing in mind to make sure that it is at peak of growth and perfect for roasting and eating right when the fair takes place. Just some fascinating information that we received from our Food Sherpa. This thing was spawned by the ice cream devil himself as the ultimate satanic sugar worship. 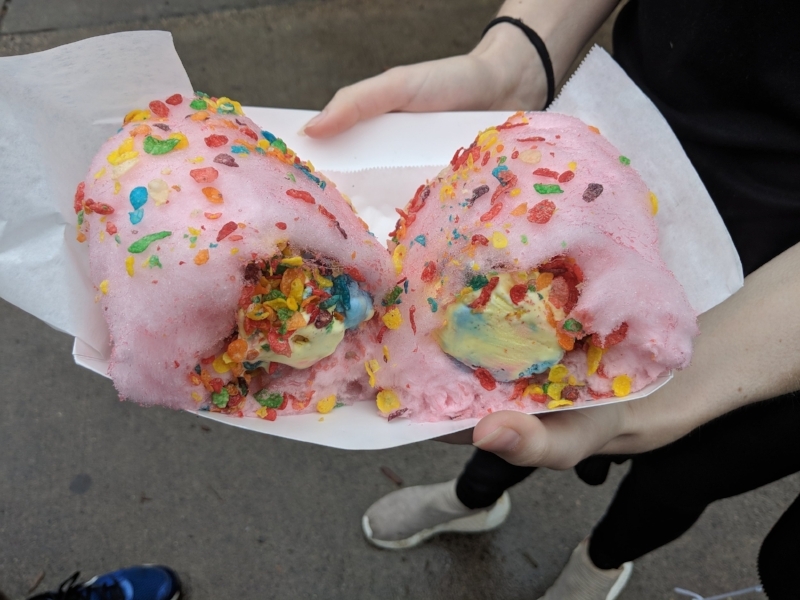 Naturally, those in our group that were non-plussed by the corn were enamored by the Rainbow Cloud Roll. I imagine that this is what Black Phillip had in mind when he was asking Quaker daughters if they like the taste of butter. If you were wondering if you should try this, I would simply ask if you would like to live deliciously. Why even go to a fair if you're not going to get these. I'm not sure our Food Sherpa had these in the program, but if you remember the simple fair rules to follow, if you want something, get it. I wanted these. I got it. 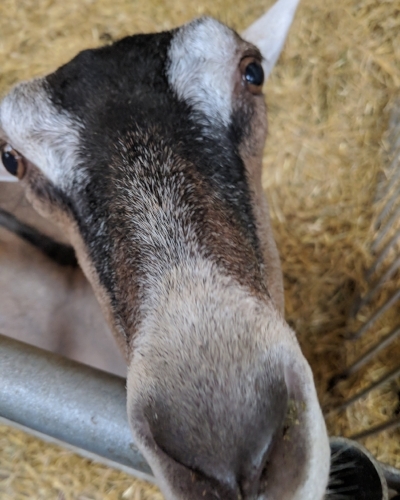 Minnesota has a great fair, but let me tell you what: The tap water is disgusting. At best, this is to the State Fair food experience as ginger is to your palate when eating sushi. I feel like this is the perfect time to provide you with a PSA: Stop drinking tap water. You can get reverse osmosis water from your local grocery store for about 40 cents per gallon and it tastes amazing. Also, it has all the garbage - fluoride, sodium, chlorine - removed. Drink more water, drink better water. 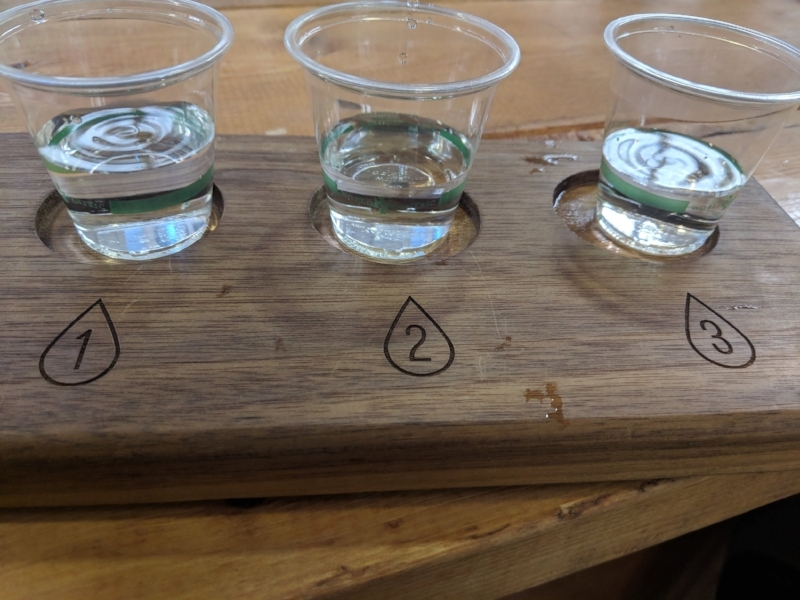 The three samples they provided were tap water from Duluth, Minneapolis, and Saint Paul. They also provided some useful information. In Minnesota, you can visit the website for the city you live in and they will provide you with the water profile for your city. I'm not sure if this is also true for Wisconsin, but I would hope so. Our Food Sherpa insisted that the Kiwanis chocolate malt was the best at the fair. After trying it, I have to say it was fantastic. Like a massive Frosty from Wendy's, only better. It's not like what they tell you it's like. I was only middle-of-the-road about this item. Only one person in our group seemed to really enjoy it. We all agreed that it wasn't overly sweet, which was great. However, the blueberry rhubarb component really downplayed the rhubarb and had a consistency more in line with a syrupy pie filling than a cobbler. I also had the Maple Syrup Nitro Coffee at this vendor. The flavor was sweet, but enjoyable. I like basically anything with a maple flavor. I'm skeptical of their "nitro," and I'm not even sure that it truly was a proper nitro. That effect might have been killed off by the maple cream, but nothing about the consistency or the flavor of the drink indicated it was a nitro coffee. You're definitely not getting that from this drink, it's basically a cold brew with sugar cream. Exactly as described. Lamb could have been better, but wasn't bad. Mint and lamb is great so this was a nice protein option after the carb and fat overload. This is my favorite candy, so a deep fried version was a smash hit. It is really heavy and you'll fill up really quickly. Better have something to drink if you plan to finish off more than one of these things in a sitting. I was warned to stay away from the fried rice as it doesn't live up to the hype, but the chicken was highly recommended. This chicken thigh skewer was grilled in a teriyaki glaze and retained all the texture and flavor as such. If you're fine with a chicken thigh, this will do the trick in a day that will leave your body craving some protein. Got this in the dairy barn. It was like a trip to Culvers, but better. Strong finish to an overwhelming day. 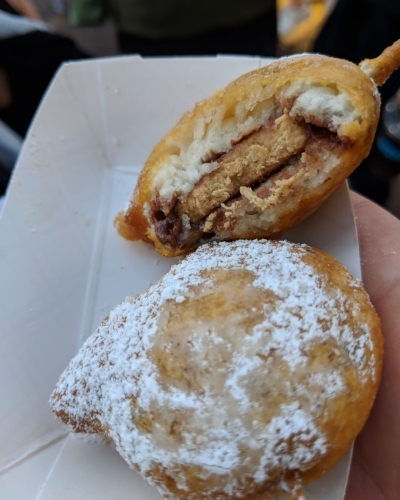 I wanted to go with the "Flavor of the Fair" option, but after all the other food, I wasn't feeling the S'mores option. Also had a chance to try buckwheat honey for the first time ever. The biggest struggle of the day was definitely the seed art, if I ever make another trip to the Fair, I'll be skipping that section altogether. 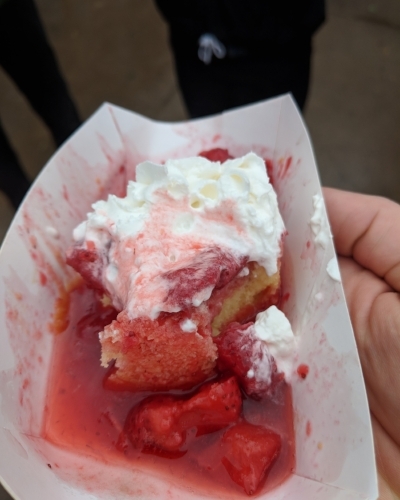 The only items missed that might have been nice to try were the turkey leg, za-waffle sticks, zesty PB&J sausage, and honey cream soda float. But hey, looks like we already knocked it out of the park. There's always next year. The 2018-19 Bundesliga season kicks off on August 24. It feels like it’s been a long time coming. Often, a World Cup summer, though drastically shorter than the normal layoff, gives a spike in both interest and excitement surrounding the upcoming club season. Infamously, the United States Men’s National Team failed to qualify for the biggest sporting event in the world by failing to distinguish themselves from the likes of Honduras, Costa Rica, and Trinidad and Tobago. The results of the last round of World Cup qualifying via CONCACAF were a blow to the popularity of the USMNT domestically, probably bleeding over slightly to Major League Soccer, the leading domestic league. In a turn of good fortune for the game as a whole, soccer seems to have weathered the storm and appears to be on a gradual rise, from the booming attendance at Atlanta United games in MLS to the rabid fandom of traditional powers in the English Premiere League and La Liga, the game has remained strong despite the weak performance from the national side. Thanks to a World Cup victory and the acquisition of Neymar, the particularly mediocre French league looks to be making waves in both popularity and a slightly improved domestic product. And after a lengthy recession from the likes of AC Milan and Inter Milan, Juventus and Cristiano Ronaldo have aroused the interest of an audience hungry for top-tier soccer that isn’t being provided by MLS or the current play of the USMNT. And yet, much like their embarrassing group stage elimination, Germany appears to be lagging with their league popularity. While August 24 marks the first competitive game of the Bundesliga season, the DFB Pokal pushed forward with a round of matches that took place over the prior weekend. When Schalke 04 took the pitch against the minnows of 1. FC Schweinfurt on Friday, August 17, it was a 19-year-old Weston McKennie getting the start in the spot vacated by now-Bayern Munich and German National Team midfielder Leon Goretzka. McKennie turns 20 in the coming week but featured in 22 matches for Schalke during the 2017-18 season. He’s also already on the score sheet in the preseason during August, scoring a goal as a substitute in a 3-0 win over Fiorentina. McKennie has also played three matches over the summer, including a friendly against France, for the USMNT. Three days after McKennie and Schalke eliminated Schweinfurt, Christian Pulisic started in Borussia Dortmund’s narrow 2-1 escape in their first-round Pokal matchup with Greuther Furth. Pulisic, also 19 years of age, has been a regular starter on one of the best teams in the Bundesliga over the past decade. Last season, Pulisic played 32 matches for Dortmund, totaling four goals and five assists. He featured in the Bundesliga, German Cup, and Champions League. In July, he scored two goals as a substitute against Liverpool. Though he doesn’t turn 20 until the end of September, this will be his fourth season in the Bundesliga. Like McKennie, Pulisic has also become a regular on the USMNT. However, Pulisic has already seen his star rise to unprecedented levels for a young American. Where other Americans like Freddy Adu, Jozy Altidore, Brian McBride, Tim Howard, and Brian McBride either showed massive potential at a young age or delivered on the promise and became first team players among the biggest leagues in Europe, none has ever come with the level of excitement that Pulisic has produced. Just this summer, Pulisic has been linked to Liverpool, Bayern Munich, Chelsea and Real Madrid. Naturally, rumors are pure insanity and drive the most traffic. It would still be naïve to assume Pulisic will stay put. And he’s already delivered on his promise in many ways that his fellow countrymen predecessors never did. Did I mention he’s still just 19? There are many American players that have had their time abroad, but prior to Pulisic, it’s hard to think of one more popular or well-known than Landon Donovan. Donovan was a star for the USMNT at a pivotal moment where the national team desperately needed a success. He was also a giant of MLS. However, his massive success came mostly after a German failure. As a young player, he spent a spell on the Bayer Leverkusen payroll, failing to make the breakthrough. Some of it likely came down to bias from other players, as Donovan himself claimed. Some of it also came down to his inability to perform and maintain his confidence in the slim opportunity he was given. He also had a spell with a particular German club to which Pulisic has been linked this summer – Bayern Munich. The German giants were compelled to give him a shot by then coach, Jurgen Klinsmann. The same Klinsmann that turned the USMNT on its head a few years down the road. Donovan didn’t take, but Pulisic isn’t Donovan. That’s no swipe at Donovan, it’s a statement about just how talented and loaded with potential is the teenager Pulisic. Perhaps the transfer rumors whirling around Pulisic are down as much to the misfortune of his current club as it is to his potential. Dortmund, an innovative upstart that went from the heights of German soccer to its depths and financial struggles, only to return with a revamped youth system, a charismatic coach, and ahead-of-the-curve training methods. They wrestled the league title away from Bayern briefly, and the two teams met on the biggest club stage in the Champions League Final in London at the culmination of the 2013 season where Bayern prevailed. Since that time, Dortmund’s luck has turned as players like Shinji Kagawa, Nuri Sahin, Mario Gotze, Mats Hummels, Robert Lewandowski, Henrikh Mkhitaryan, Ousmane Dembele, and Pierre-Emerick Aubameyang have all exited the club. The very thing they were built on – a strong youth system – has left them open to poachers both domestic and abroad. Naturally, Pulisic is next on the list. But the Bundesliga isn’t just a training ground for the future stars of the EPL and La Liga. The Bundesliga has been rated in past seasons as the highest-attended matches of all soccer teams in the world, averaging almost 44,000 tickets sold per match, followed closely by the EPL – about 5,000 tickets behind them. There’s also a significant amount of action in the Bundesliga. One reddit user, Serie_Almost, calculated goals across the major European leagues, and factored for the different number of games. Using those totals, the Bundesliga almost entirely dominates the list he came up with. There can be many factors, but this chart gives you a good idea of how the leagues stacked up over the course of a decade. Additional ranking metrics across the top European leagues that factor in expected goals (xG), possession, and attempted runs/dribbles consistently rate the Bundesliga and its clubs at the top. A consistently live atmosphere, high goals per game and xG, and non-stop action combine to make the Bundesliga a top product in world soccer. You’d think this would make the German league must-see soccer in North America. Corroborating this sentiment, Bayern announced a partnership with FC Dallas of the MLS earlier this year. Essentially the deal, which may set precedent for the future but is something altogether new at this stage, allows for the two teams to allow exchange of training and coaching, particularly with youth players. Given the influx of talent from players like McKennie and Pulisic, both USA nationals, Bundesliga teams are starting to identity a relatively cheap and effective way to source emerging talent. As eluded to earlier, this kind of German-American collaboration isn’t out of the blue. Klinsmann was a star player for club and country in Germany, achieving success internationally. After a spell coaching the German National Team and Bayern, he shifted to the United States and took control of essentially the entire USMNT system, flipping it on its ear. There were shouts from all directions during his tenure, many believing he was leading the team astray, but also that he was upending institutions and preconceptions that were impeding the progress of the USMNT. To date, the USMNT has looked bitterly disappointing from the end of his time in charge and has lasted since. However, the link to Germany that he helped develop could yet yield a whole new generation of talent. 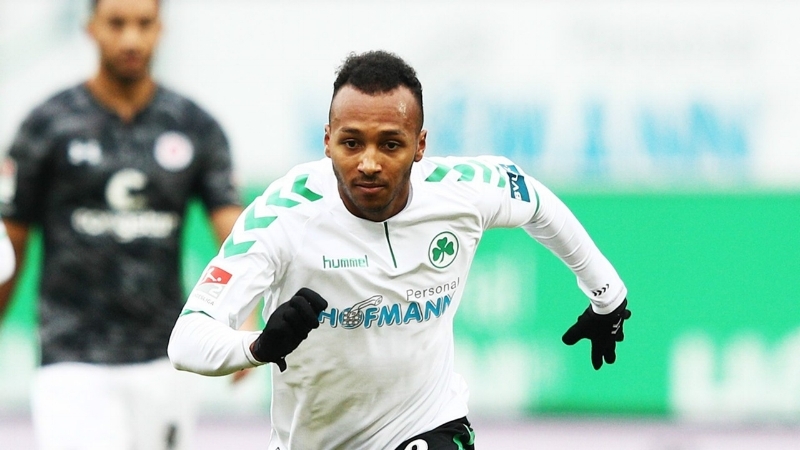 Nothing is guaranteed, but teams in Germany continue to take fliers on Americans, including Julian Green. Green is an example of a player who was thrust forward too early, given the chance to fight for a place under a Bayern side that was looking for more success on the heels of a Champions League title and the oversight of ex-Barcelona manager, Pep Guardiola. Playing time sparse, the talented young Green didn’t immediately reach his potential, which found him transferred, then loaned out, then sold for a fraction of his perceived value. His newest club is 2.Bundesliga side Furth. He featured as a starter against Dortmund and Pulisic on August 20. In 2014, Green became the youngest American to score a goal at the World Cup. The picture is beginning to come into focus: The Bundesliga that looked off Donovan now looks for American talent. But is America looking for the Bundesliga? Certainly the numbers have improved. Bayern has toured the United States for many years and recently established an office in New York. Other Bundesliga sides have begun to follow suit. Bundesliga has made the transition from being shown on Gol TV, to the Fox Network, dominating the FS1 Network every Saturday morning. But the battle has always been uphill against the EPL, which has the most ease in adoption amongst soccer viewers. Is it the language? Do Manchester United, David Beckham, and Dennis Bergkamp carry enough weight to sway the loyalty of an entire population? To be fair, those names, even Man U these days, are a bit dated, so is it the oil money that brought fresh life to Chelsea and Manchester City? Perhaps it’s the fascination with plucky mid-tier teams like Tottenham and Everton or the downright disappointing existence of Arsenal. Even LeBron James is in, as part owner of Liverpool. It’s not just the EPL, however, that has captured fans. The dominant teams of the past decade have mostly plied their trade in La Liga. Both Barcelona and Real Madrid have spent that entire time winning their domestic league and the Champions League. The two squads were home to Lionel Messi and Cristiano Ronaldo, who did battle back and forth for seemingly ever. The Madrid team has conquered Europe for three consecutive seasons and it shows across social media as first-sport basketball, baseball and American football fans cheer for La Liga. Spain also dominated as a national side. They won the European Championship in 2008 and 2012, with a 2010 World Cup triumph sandwiched between. In addition to La Liga’s world stars from Argentina and Portugal, there’s a host of Spanish players who have become household names – Sergio Ramos, Iker Casillas, Gerard Pique, Andres Iniesta, Pedro, Xavi, Xabi Alonso, Cesc Fabregas and many, many more. During the summer transfer window, Bayern has spent precisely zero to date. It’s absolutely astounding for a club that rates No. 3 among all clubs in the entire world according to the metrics of FiveThirtyEight. However, the club hasn’t been completely quiet. Rumored agreements for future transfer window exist, but the giant club has made one agreement that will take place in January – the purchase of Alphonso Davies from the Vancouver Whitecaps of MLS. Davies, a pacey future star of the Canadian National Team plies his trade on MLS pitches across North America every week – and soon he will do the same in Germany. While not part of the USMNT, he will join a full cast of North Americans. The road for the youth of today was paved by a generation of players that fought their way through the Bundesliga and 2.Bundesliga long before them. Players like Jermaine Jones who held down starting roles for Schalke and the USMNT, along with Tim Chandler who worked for both Eintracht Frankfurt and 1.FC Nuremberg dating back to 2007 along with several years playing for the USMNT. 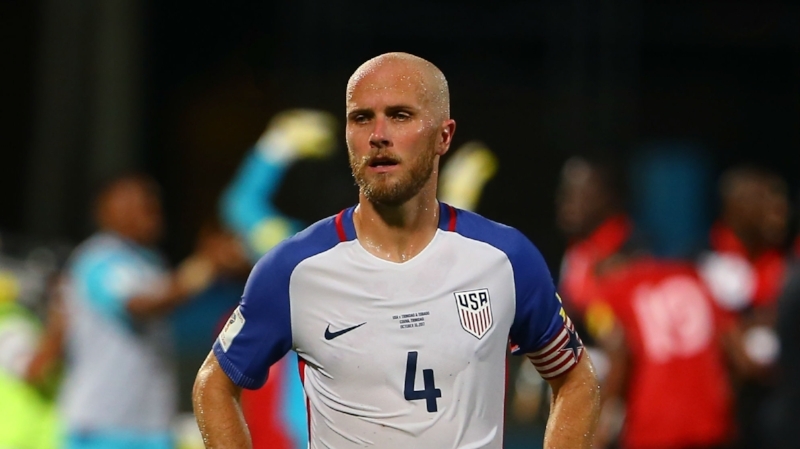 Michael Bradley, USMNT captain and son of former USMNT coach Bob Bradley spent his fair share of time running the pitch for Borussia Monchengladbach. There’s also many others, including a name popular among USA fans for a while in Bobby Wood. Wood played with 1860 Munich, FC Union Berlin, and Hamburger SV prior to joining Hannover 96. There are naturally some potential drawbacks to the league. All non-Bayern fans will immediately blame the Munich juggernaut for the woes of the league – purchasing the best players of the other teams in the league, an embarrassment of riches, and the list goes on. Bayern is currently riding a streak of six consecutive league titles. Contributing factors to be sure, that should not be enough to sink the ship. Juventus, part of Serie A that just signed a new television deal with ESPN, is riding a seven-season winning streak. The Germany squad also won the 2014 World Cup and has had a strong showing in almost every single tournament they have participated in for the past 40 years – except the 2018 World Cup. The downside of Bayern’s dominance shouldn’t be enough alone to keep the league down. With record attendance and more action and scoring than other leagues in the world, there’s too much good to get lost in the shuffle. The future of the USMNT is bright. Some such phrase about how dark it is before the dawn. 2018 was a low point for the national team, but the next wave of talent is on the rise – in Germany. In a story published by the Bundesliga on August 22, players were selected at each of the 11 positions to watch as “Wonderkids” in 2018-19. Of the players listed, four were American. Joining Pulisic and McKennie are 18-year-old Josh Sargent of Werder Bremen and 21-year-old Jonathan Klinsmann of Hertha Berlin, who is indeed the son of the former German, Bayern and USMNT boss, Jurgen. Pulisic may be on the move in the near future, but he’s currently not alone at Dortmund as the team also boasts American midfielder Thomas Delaney and is reportedly set to sign USMNT U17 midfielder Giovanni Reyna when he turns 16 in November. Reyna is son of former USMNT player Claudio Reyna. With each passing season, the connection between American and German soccer seems to grow on the pitch. Hopefully, it will grow off the pitch. More than ever, Americans love soccer. It’s time that they start loving the Bundesliga, too. It's been two months since the release of Tomb Mold's headbanging ripper, Manor of Infinite Forms, on 20 Buck Spin, but the mature and textured sounds on this album call to mind an album from more than two decades ago. Tomb Mold, for those late to the party (kind of like the write-up), is a death metal outfit from Canada. Their sound shows influences that are well selected from across the extreme metal landscape, all while keeping a sound intact that feels like their own in the crowded landscape that is awesome death metal in 2018. I'll admit that Tomb Mold's new album got lost in the shuffle at first as I sorted through all the new music I've been trying to take in this year, but I was reminded that there was something I really liked about the band when they started popping up on my social media. Then a friend made the trek to Migration Fest in Pittsburgh. Seeing the lineup for the fest reminded me of several bands that I wanted to dig more into, including Tomb Mold. By the time he shared a clip of their live set, I was already a full weekend of listening into the process and the footage confirmed exactly what I though - Tomb Mold rules. It's easy to get hyped on a band in the moment, but what intrigued most about Manor of Infinite Forms is that the songs have a certain sound to them that is as close to transcendent as is possible in this day and age. It feels like more music than ever is being produced by more artists and with every Bandcamp page the springs up, there's another one ready to replace it as the best sound of the week just a few days later. It was while listening to "Blood Mirror" that I realized there was something more to this for my attraction to their sound. The song appeared first on their Cryptic Transmissions cassette, and it first triggered a signal in my brain to a sound I remember first hearing in metal way back in the mid-1990s. I was probably still in middle school when I became obsessed with Mortification. Their album Scrolls of the Megilloth is an all-time favorite and absolutely genre classic, but they also released several other albums that had some variance of the extreme metal sound. Released in 1993, Post Momentary Affliction was both crazily heavy and very unique in sound and approach. The artwork for the album was banned in the United States and they had to have a separate album cover for that market. Post Momentary Affliction was a landmark album and it has done something that few other albums have done in the death metal genre over the past 25 years - remained relevant. And it is that legendary release that provides the same kind of atmosphere and sound that is present on Manor of Infinite Forms. I'm not trying to step across 25 years of extreme music and simply say that these are the only two albums that share similarities, nor am I trying to say that the members of Tomb Mold even know or like Mortification. What I'm saying is that there is something fantastic about both of these artists that resonates with me, crossing time, to channel fantastic atmosphere and sound.